Opinion: Are CD ripping services a rip-off? I've been meaning to rip my entire CD collection to MP3 for some time now, but I never seem to have the time to sit down and feed the discs into my computer, then import them one-by-one. It seems like this is the perfect kind of menial labor for which we invented robots. Disc Makers knows what I'm talkin' bout, Willis. 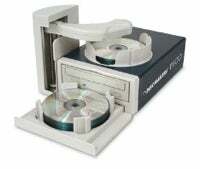 That's why they're selling this Pico Automatic CD/DVD duplicator with MP3-ripping capability. Feed 25 discs into Pico's caddy, and it'll rip each one to the format of your choice, even retrieving information from the CDDB while it does. 12 CDs per hour may not seem like a lot, but that's an hour that I don't have to spend doing the same thing. Since it's USB compatible, it'll work with Macs or PCs. The only thing holding me back is the $700 pricetag. Hey, Disc Makers, need somebody to give this sucker a review?